Want to ditch your toxic health and beauty products and achieve vibrant wellness at the same time? 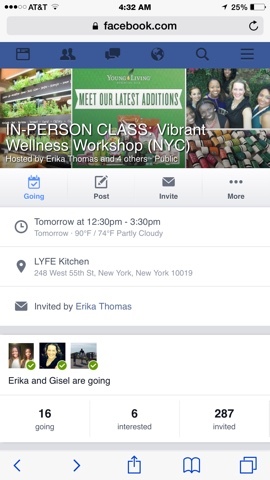 Join us for lunch at LYFE Kitchen in Midtown Manhattan and learn how Young Living Essential Oils can be used to help you become the healthiest, most vibrant, energetic person you can be! Your class hosts and others will share some our personal experiences and show you what makes Young Living remarkably different from anything else we've tried before. You'll hear our transformation stories, which each began with a shift in our mindset about wh...at it means to be healthy. Learn how we've grown and changed over the past year and discover all the amazing resources and support you can receive from our commmunity when embarking on your own wellness journey! * Discover what essential oils are and how we use them in our everyday lives. * What makes Young Living different than the products found in health food stores. * Find ways to boost immunity and support focus and concetration as you head back to school. *Be introduced to many of the brand new products that were released by Young Living this month. * Have an opportunity to make your own homemade health/beauty items in less than 5 minutes! The cost for the class is FREE. Raffle prizes will be awarded all afternoon long with plenty of chances to win! You will also have the option of making your own essential oil-infused products to take home with you at the cost of $5 each (cash only).